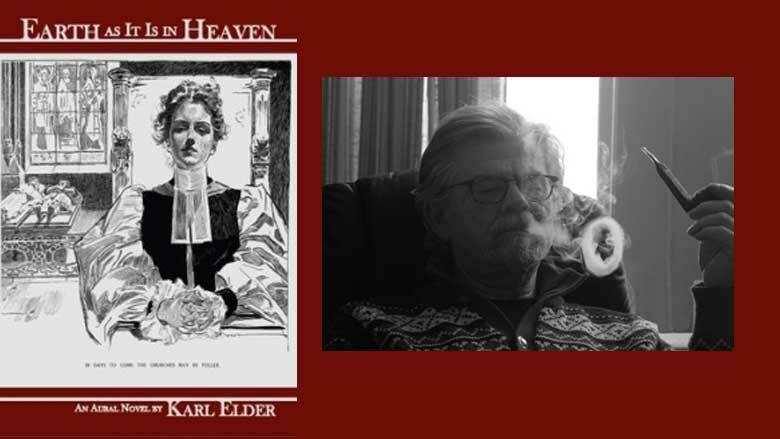 A parable of religious mysticism that’s part love story and part mystery, with a touch of rural hijinks, Karl Elder’s new novel is a welcome addition to the list of titles from one of Wisconsin’s top poets. The Jacob and Lucile Fessler Professor of Creative Writing and Poet in Residence at Lakeland College, Elder has received national recognition for his unique and highly skilled achievements in complex poetic forms. His first novel displays the same experimental streak as his poems and shares a similar metaphysical bent. Written in first-person narrative, Earth as It Is in Heaven: An Aural Novel chronicles the religious evolution of Charles “Stick” Cousins, as cultivated by the woman who is his teacher and spiritual mentor, Luda Corvus. The revelatory energy and pace of the novel work to make the reader an accomplice/witness to the miracles that gradually accumulate, leading to transformations in Cousins, Corvus, the town, and potentially the reader. The novel is written in a dialect of Elder’s invention, which could have been a huge distraction. While familiar enough for the average reader to understand, it took me the first twenty pages to adjust to the speech patterns. As an aural novel in which the sound of the language is emphasized, the rhythm of the dialogue is as important as the plot. Elder’s storyline itself seems almost subservient to the evolution of character enlightenment occurring throughout the book, existing at times only to serve the novel’s concept of transcendence. With references to early TV, pocket transistor radios, and a “new” restaurant called McDonald’s, the setting is a small town during the 1950s. Yet it feels like rural 1920s, conjuring 1950s noir novelist Jim Thompson’s tale of dustbowl Oklahoma, Cropper’s Cabin, and the poetic short novels of Richard Brautigan, which are spiritual, surreal, imagistic, whimsical and at times gentle. Much of Elder’s poetry is minimalist, stripping the world down to a few objects that symbolize another world behind that which the objects inhabit. It’s a technique Elder handles well in his poems, and he uses it to advantage here in Earth as It Is in Heaven. Like his complex and masterful poems, Karl Elder’s first foray into fiction deserves attention.